We really didn’t know what to expect when we bused it to Riga. 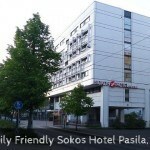 I was worried I would be disappointed after the wonderful Old Town in Tallinn and that everything would be second rate. I worried for nothing. Cosmopolitan Riga is the biggest city in the Baltics, and it would be hard to skip this city on a Baltic country adventure and not just because it is in the middle of Tallinn and Vilnius. It has many attractions and is just a damned nice place to hang out. It’s Old Town may not be as stunning as Tallinn’s, but it is stunning and it feels more real. There are not as many tourists and there are plenty of real Latvians going about their daily lives which added to the appeal for us. There is also the newer art nouveau architecture, the Central Market, nearby Jurmala and some other areas to check out. The Old Town of Riga is beautiful and the perfect place to start your stay. It would be our biggest Riga must see attraction. The streets are winding, full of colourful buildings, restaurants, bars and attractions. Something we really loved about the Old Town in Riga is how real it felt. Despite being in Riga in late June, there seemed to be more locals around than tourists and we liked this real edge to the place. The House of Blackheads was originally built in the 14th century at which time it was the most prestigious building in the city. It was severally damaged in WWII and rebuilt again from blueprints in 1999. It makes for quite a sight. Unfortunately, it is closed to visitors at the moment until the end of the year. This small museum next to Blackheads, documents the horrors for Latvians in being part of the 1940-1991 Soviet-Nazi-Soviet sandwich. It tells the story of Latvia’s oppression since the initial days of Soviet occupation. There’s few exhibits but rather photos and maps to compliment the narrative. Most items and documents are not in English but the narrative itself is hard hitting enough. Especially the part dealing with the Nazi liquidation of Riga’s ghettos. Entrance is free but there’s a large donation box next to the entrance. This big, red brick church was first built in 1209 from timber before being rebuilt with stone. There are some great views from the spire and the big bonus with this one is that there is a lift up to the viewing platform! The largest square, Dome Square, is where you will find the many outdoor cafes and the massive Dome Cathedral. 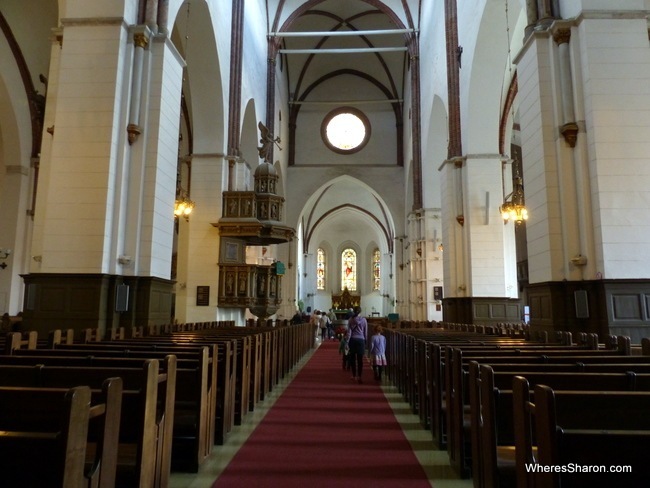 This cathedral is the biggest in the Baltics and worth a look inside. It also has a nice grassed courtyard area with some exhibits. This tower dates back to 1330 and is home to the Latvian War Museum. 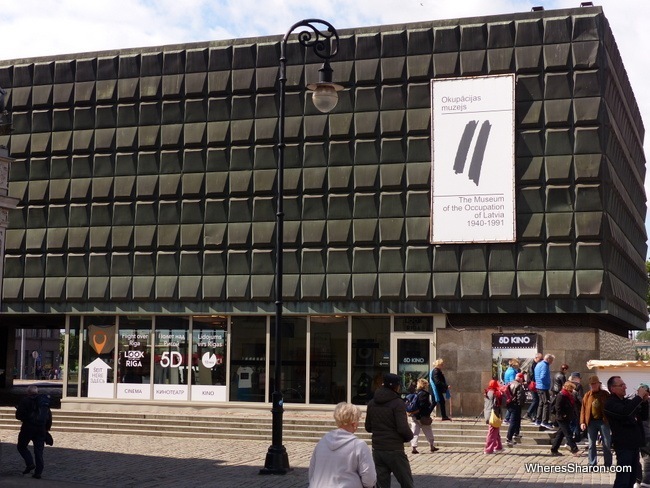 This museum shares the political and military history of Latvia with a particular focus on the 20th century. I enjoyed what I experienced of this museum and there was some interactive exhibits which the kids enjoyed. 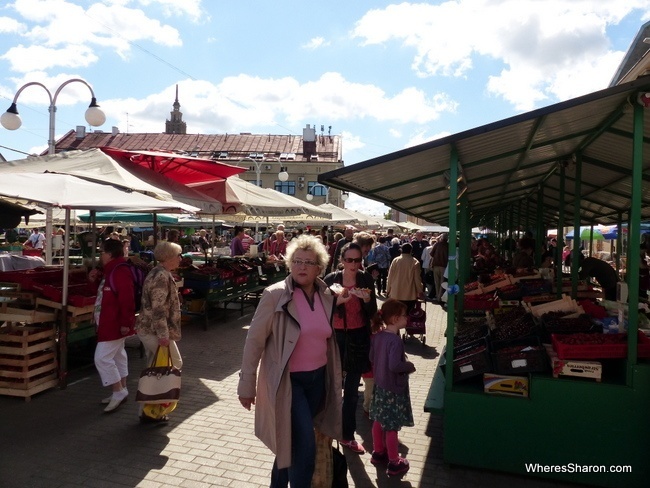 Another must see in Riga is the Central Market. We loved this place! The Central Market is next to the Old Town and a fabulous place to wander, pick up some bargains and eat. It’s quite big with most of it inside with some stalls surrounding as well. You can pick up fruit and vegetables, meat products, cheeses, other deli items, baked goods, souvenirs – most things really. 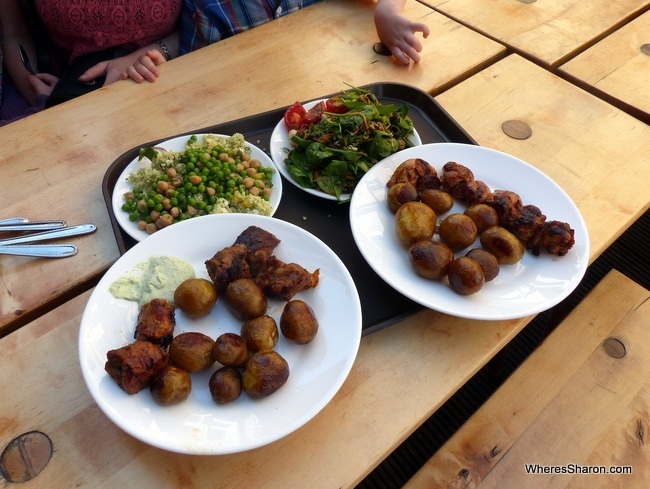 There are some great meal items as well and we enjoyed snacking as we walked around here. Another of our favourite places to visit in Riga is the Academy of Science. This big building is noticeable from all around. The Soviet design is not pretty, but the views from the top are! It’s a great stop near the Central Market. Entry is 4 euros for adults. A couple of blocks from the Academy of Science is the Holocaust Memorial at the site where a large synagogue was burnt to the ground during WWII with the entire congregation trapped inside. 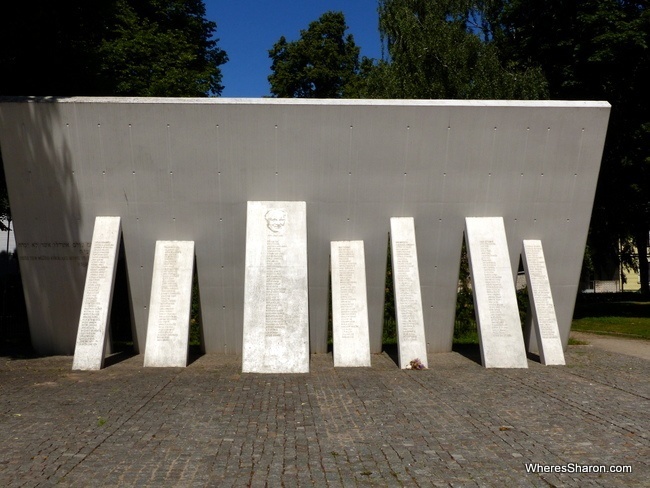 The memorial is dedicated to the Latvians who protected Jews during the war, but it is hard not to think of Latvia’s Jewish population of 90,000 which was all but wiped out (only about 100 survived). It’s heart breaking to think about. 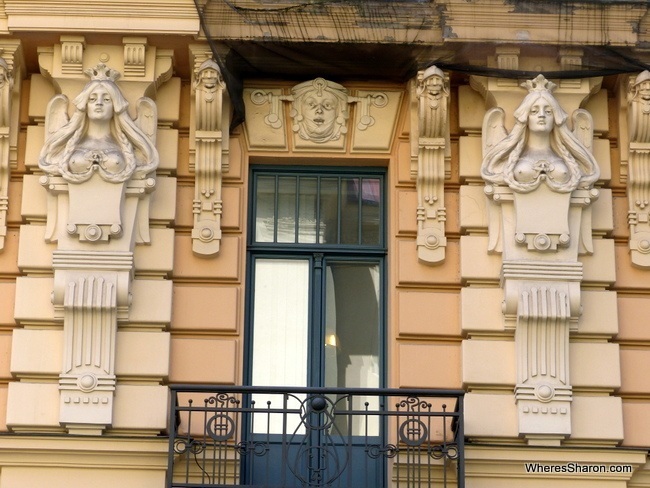 Riga is home to over 750 buildings with flamboyant art nouveau architecture. You can see it across the city, including in the Old Town, but especially in the area surrounding the Old Town. The best way to see it is on foot with your eyes skyward. 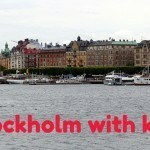 We followed a walking tour from our Lonely Planet to discover this part of the city. It’s an activity which works well with kids. They liked finding the different animals and features on the buildings, and the area where we walked around around Alberta Iela has nice wide streets with wide footpaths to make it even easier. 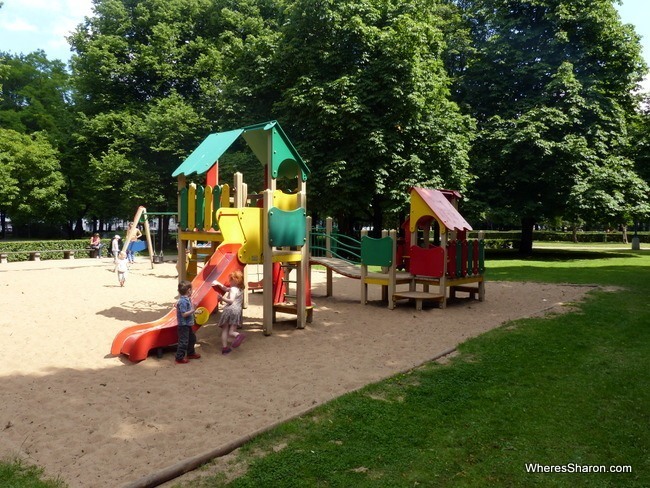 If you are looking for things to see in Riga for kids there seems to be many parks and playgrounds and we had no problems finding them. 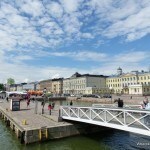 A good place to start is the canal area which marks the boundaries of the Old Town. There are beautiful parks lining the canal. Just on the other side of the canal, we found playgrounds at the Esplanade (pictured above) and Vermancs Garden. We also went out to Mezaparks (translates to Forest Park) which is a great big park and also home to the Riga Zoo. It takes about 30 minutes to reach here on tram 11. 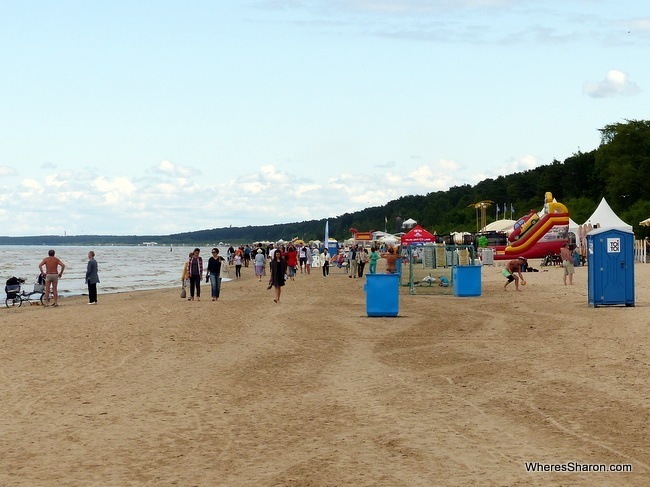 One of the most fun things to do in Riga is visit the nearby town of Jurmala. 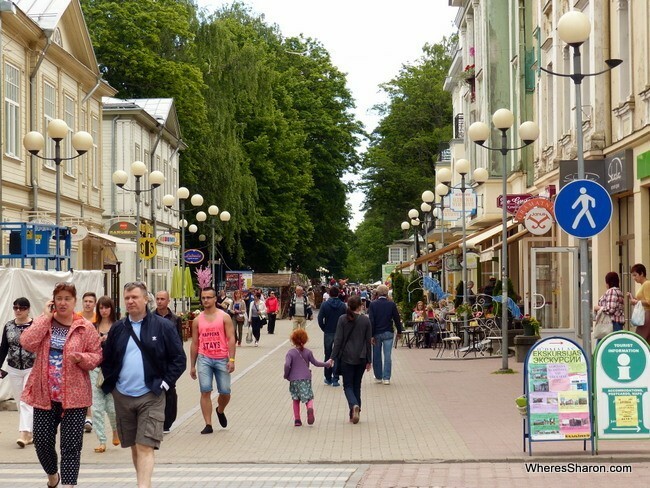 Jurmala is a wealthy Baltic beach town just a 30 minute train ride from Riga. It’s a lovely place with a great stretch of sand – although no way I would be sunbathing or swimming in this weather! There is also a nice main strip and a very lovely forest park. I had wondered what a Baltic beach would look like since I couldn’t imagine actual swimming. The beach was nice and wide with playgrounds, jumping castles, restaurants, bars, ice cream stands and portable toilets right on the beach. It’s quite accessible too with many people pushing around strollers. We didn’t see anyone in the actual water. There were a few people sun bathing but most were walking around, fully dressed with big jackets. There was a party like atmosphere and it was a nice place to be. I also liked the main strip at Jomas Iela. This is a pedestrian only strip with many small parks, shops and restaurants and a good crowd. The kids’ favourite places was definitely Dzintari Forest Park. This park is awesome! It does feel like you are in the woods and there is some cool equipment including a big flying fox and huge climbing nets. This would be great for older kids as well. There is also a dedicated roller skating/blading track and many walk ways. It’s a beautiful place. You can catch a train from Riga to Jurmala, the main stop is at Majori. We got off here, then hopped on again at Dzintari. It cost 1.40 Euros each way. Our kids were free. We stayed in Riga for a week. By far the best deal we could find was renting an apartment through Airbnb. This was only 295 euros for 7 nights. We stayed in a massive one bedroom apartment in the Old Town. It was just perfect for us with plenty of space. It is technically only one bedroom but there are lots of rooms, a sofa bed in the lounge and two bathrooms. The kitchen is fully equipped and we did cook during our stay. The best part, though, is that there is good internet and a washing machine! It was the first chance we had to wash our clothes since we hit Europe. We did not find laundromats easy to find in Stockholm, Helsinki or Tallinn – they were either shut for the Midsummer or not open in the evenings! If you are not an Airbnb member yet, we would love it if you could sign up with our link. Then we both get US$25 off our next rental. You can then view the apartment where we stayed here. 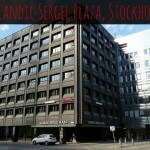 There are good places to eat seemingly everywhere in Riga as well as good supermarkets. Things tend to be a great price although you are going to pay more to eat in the centre of the Old Town (generally). Places seemed to generally be kid friendly. We noticed lots of high chairs and colouring in pencils and sheets. In the Old Town, we especially enjoyed Alus Seta (more below) and Peter’s Brewhouse. Peter’s Brewhouse gave colouring sheets and pencils to the kids and we enjoyed the beer tasting. The Central Market is also a fabulous place to get some food or eat a meal. We loved this restaurant in the centre of everything and went to lunch there a lot. It has a beautiful setting and a great selection of food for lunch including a salad buffet, many meats and vegetables and desserts. You can chose what you want, and it worked well for all of us including me as a vegetarian. It was great to eat so well and for a very low price. We could all eat for less than 20 euros which includes some great beer for the adults. It is part of the LIDO chain so look out for them. More information here. We also enjoyed the LIDO restaurant in Jurmala where there was also some people dressed as big animals handing out balloons. 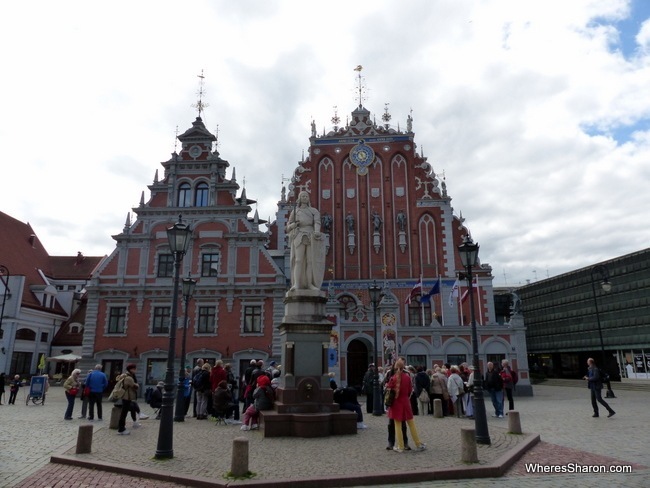 We went to Riga overland from Tallinn, Estonia and went on to Vilnius, Lithuania afterwards. There are trains in this part of the world but Tallinn to Riga by train or Riga to Vilnius just does not work out. This meant we were left with buses which are a fabulous option. We went with Lux Express which meant we were in spacious, comfortable coaches that went express between these destinations. The best part was that we had internet on board and our own seat back entertainment systems. Our Lux Express bus to RIga! 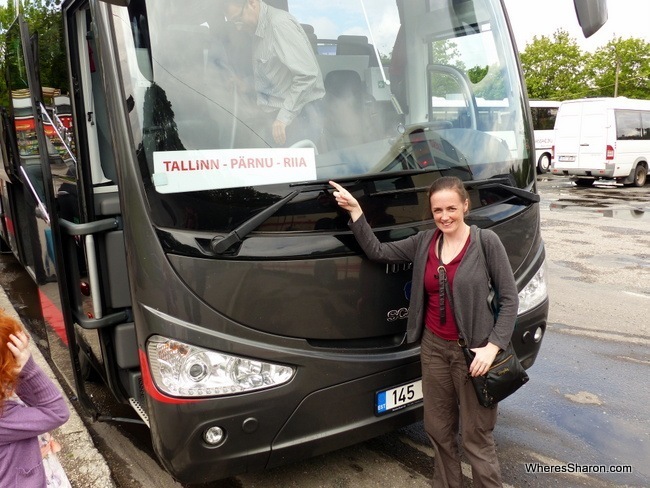 Tallinn to Riga by bus is an easy 4.5 hour bus ride. We all spent the journey watching movies on the entertainment systems and planning our Riga things to do. Read our Tallinn guide here. The Riga to Vilnius bus is equally easy and also takes about 4.5 hours. It was much the same as the journey to Riga on Lux Express. We had seat back entertainment systems, wifi, free hot drinks (including hot chocolate, yummy) and it really could not have been easier. Read our Vilnius guide here. Read more about getting around the Baltics here. 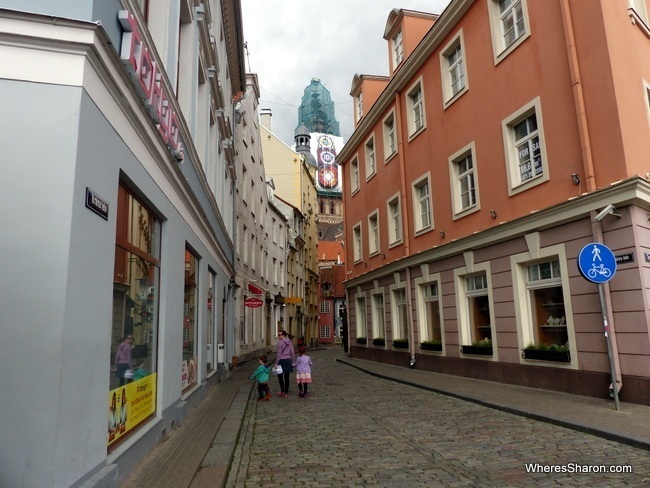 One of the many things that we loved about Riga is that we got around most of it by foot. The only attractions that we needed public transport for were Mezaparks (for the big forest park and Riga Zoo) and Jurmala. We caught a tram and a train for these journeys. They were both very straight forward, cheap and easy to buy tickets for. Riga is an absolute bargain. 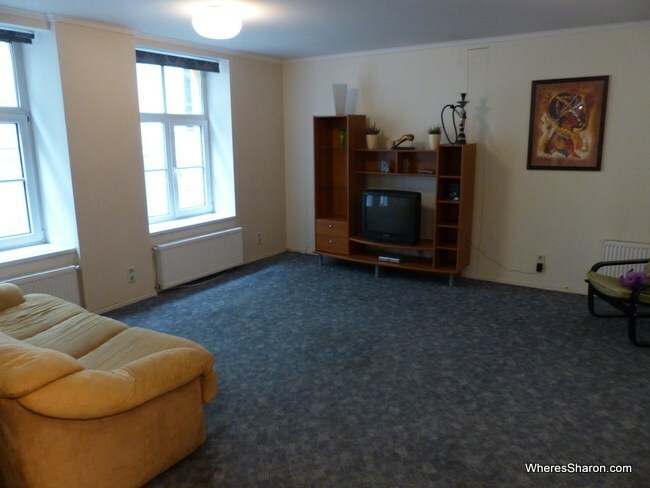 We had a budget of 80 Euros a day and we had no problems keeping to this especially with our great value apartment. We ate well, sampled many different beers and visited all the attractions we wanted to. We had a great time in Riga with our kids. They had fun exploring and even got into the architecture thanks to the art nouveau style. They were free at the attractions we visited. 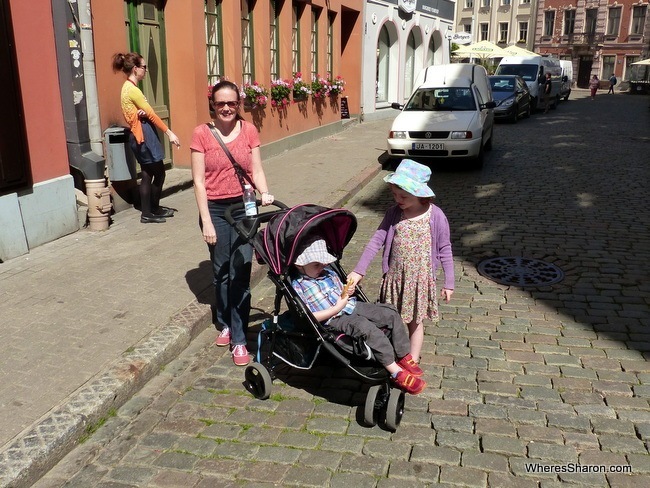 We bought our stroller in Riga and had no problems taking this around with us, although the cobblestones did give us a bit of a work out! We found it to be a family friendly destination. Restaurants would pull out colouring pencils and paper. High chairs seemed normal and most places are pram friendly. There are many parks and playgrounds. For kid specific attractions, you can visit Riga Zoo or the Latvian Ethnographic Open Air Museum. 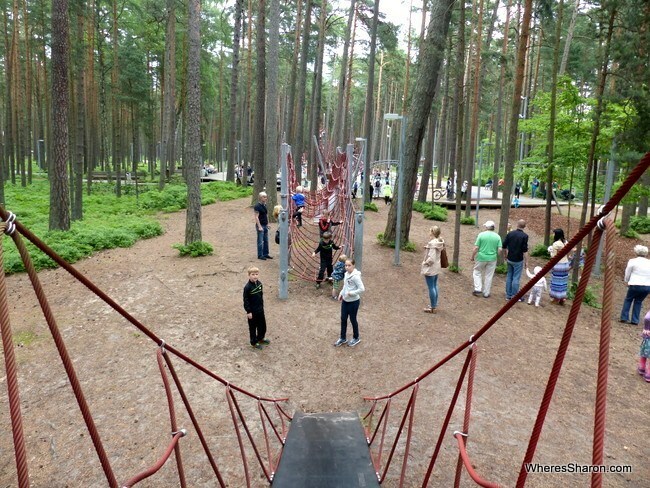 They enjoyed our trip to Jurmala the best – especially the beach and the forest park. 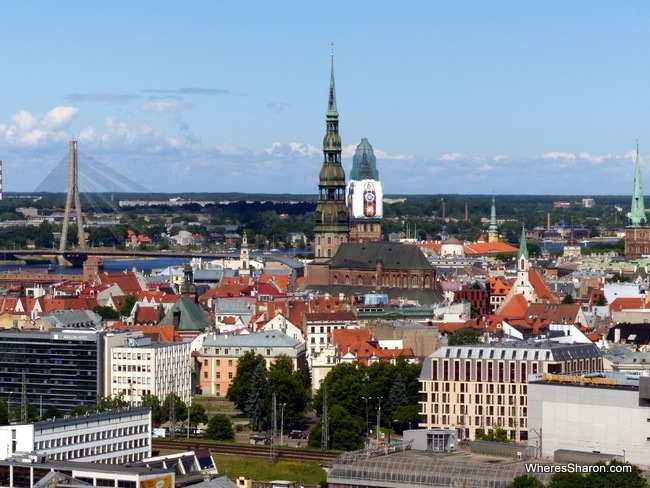 We loved Riga and are so happy that we budgeted a week to spend here. There are so many nice pockets and it is awesome to just walk around. Riga’s Old Town is beautiful but has a lived in feel as well which really appealed to us. The weather was also a bit nicer during our stay here and it was nice to see all the locals out and about and obviously enjoying the sunshine. We found this such a great place to hang out and just enjoy that we could imagine spending a much longer period of time here, especially as it is so budget friendly. So, get to Riga! What are you waiting for? You can also read our guides to Tallinn and Vilnius. Disclaimer: This article contains affiliate links. If you make a purchase after clicking on these links, we may receive a small commission at no extra cost to you. Thanks for supporting our blog! Seems you got lucky with Peter’s Brewhouse!!! I had the worst diarrhea of my life after visiting this place. And it was not just me, but also my husband. Standard food poisoning, you eat something and two hours later you take turns in the toilet. Horrible, horrible place that ruined my vacation. For three days I felt like my insides are gonna come out, and this was even worse than in India. This is not your regular Delhi-belly when you feel sick for a few hours, but full blown Peter’s-Brewhouse-belly. So would never recommend this place, and especially not with kids. Oh no, so sorry you had that experience. Thanks Emma 🙂 It’s a great place. This city is so beautiful, still on my ‘wanted’ list. I am from Poland so have so close to those countries, but for some reason always headed to hot places in search for sun. Now, after living in a desert, I don’t long for it so much and choose not so summery destinations. Thank You for this post buddy. 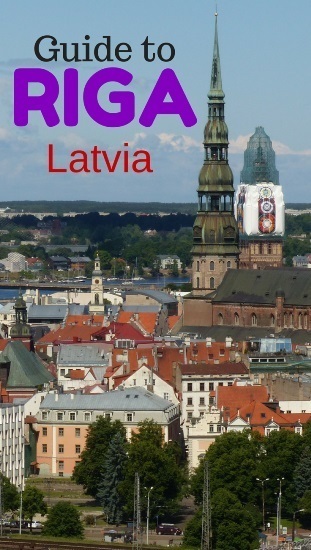 I never heard of Riga and never got any attraction to Latvia. And seems like a place with my budget. We will see,If im lucky I will have the same fun you and your family had. And thanks for the tip about the AirBnb. Sharon, We also really loved Riga! I would add that the Central Market is a must-see. I loved all the pickled vegetables! I loved Riga too! And, I agree – Lux Express is the way to go! What a deal (and super comfortable)! We had 4 days on a budget and we really felt like we made the best out of it and saw lots of what you recommended – such a beautiful city! One of the nicest trips I’ve experienced so far. Would love to come back some time, maybe also for a longer period. Thanks for sharing this wonderful post with us. By seeing your pictures one can know how beautiful Latvia is. 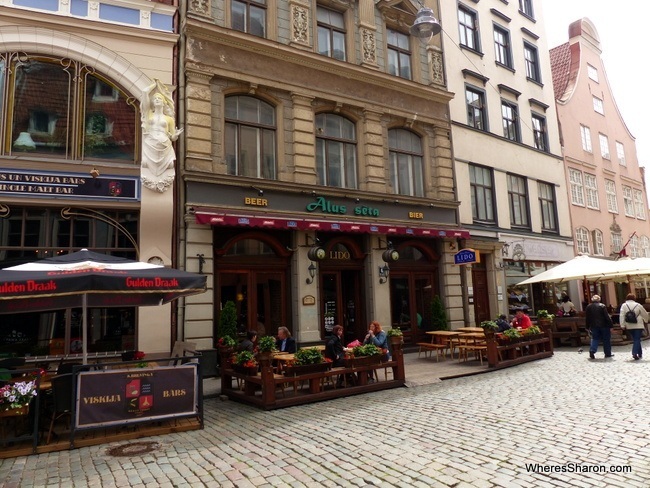 Riga has plenty of nightspots to entertain stag parties during the evenings as well. A popular place to start is the Old Town, and particularly in the Town Hall Square. I recently visited Riga for the first time and I absolutely loved the city, the Old Town is one of the best medieval examples that I’ve ever seen!